Lorenzo's Music is an American indie rock band from Madison, Wisconsin. 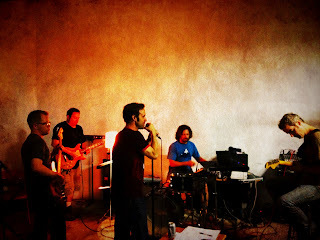 The band is composed of Tom Ray (vocals); Mark Whitcomb (guitar, backing vocals); Cliff Hammer (bass); Rob Gugel (drums); Bryan Elliott (baritone sax) and Eric Bruzewitz (keyboard, guitar, percussion, backing vocals). The band was formed in late 1994 by lead singer Tom Ray. The name of the band was originally Lorenzo Music after Tom saw the name in the credits of the 1970s sitcom The Bob Newhart Show, Lorenzo Music was one of the shows creators as well as a voice actor (Carlton the doorman, Garfield). The apostrophy S was later added to avoid confusion. The band was contacted once in the late 90's by the actors lawyer and asked for a copy of their CD. No further communication was made after that. The members of Lorenzo's Music played in various bands during the 1990s including Fallacy, Carl, Mind Ox, Little Blue Crunchy Things, Jewbakka, Monovox, Mad Trucker Gone Mad and Ladybeard. Tom Ray and Rob Gugel were in Fallacy which broke up in 1994. Tom had a job booking bands at the night club Paramount Music Hall where he met Mark Whitcomb (Carl), Bryan Elliott (Little Blue Crunchy Things, Jewbakka), Scott Beardsley (Mind Ox) and Cliff Hammer (Monovox), who were in bands that had played there. During this time Tom Ray approached Mark Whitcomb and Scott Beardsley to play the songs that he had written for his new band project, Lorenzo's Music. The line up shifted slightly over the years. Eventually Cliff Hammer, Bryan Elliott and Eric Brusewitz were added.